Artwork is displayed in the North Entrance, the Pasadena Centennial Room, the Humanities Wing and the Reference & Business Wing Display Cases. 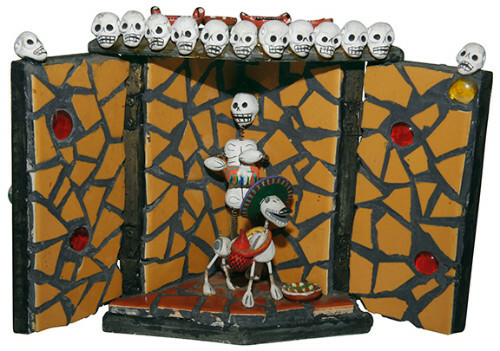 The artwork explores the various themes surrounding Halloween and Dia de los Muertos. 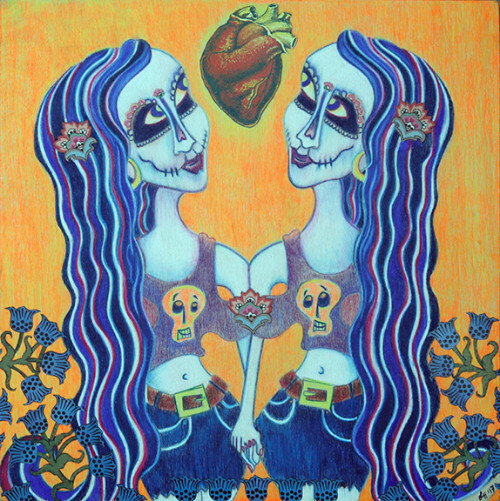 Come meet the artists and discuss their artwork Saturday, October 14 is the Artists’ Reception from 2 pm to 4 pm in the library’s East Patio. Refreshments and hors d’oeuvres will be served. 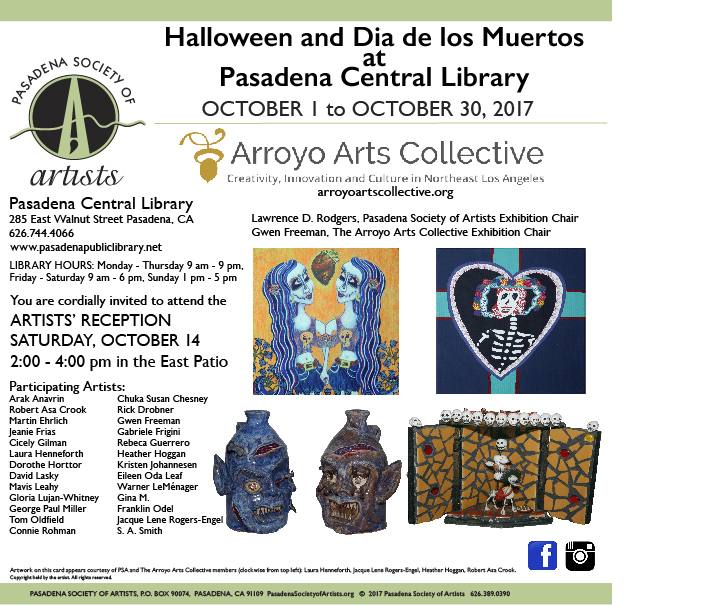 View the exhibition during the Pasadena Central Library hours: Monday – Thursday 9 am – 9 pm, Friday – Saturday 9 am – 6 pm, Sunday 1 pm – 5 pm.  Founded in 1925, the Pasadena Society of Artists is one of the area’s original professional artist groups. The Society is noted for its vigorous, active membership, wide diversity of artistic statement, and high professional standards. 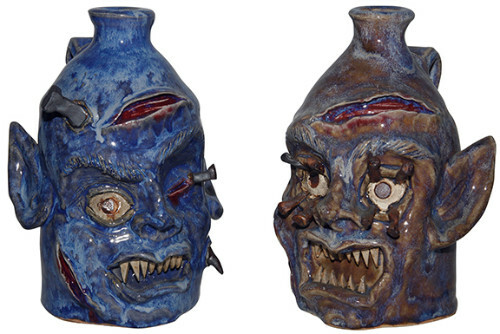 Membership is by juried submission. 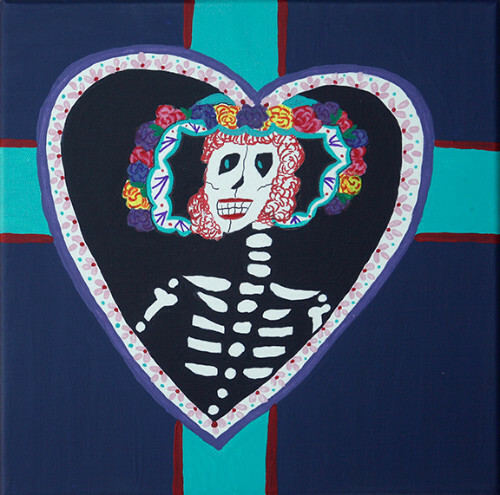 The Arroyo Arts Collective is a grassroots, community-based organization of artists, poets, musicians, performers, craftspersons and supporters of the creative community in Northeast Los Angeles. The Collective has, since its founding 1989, provided venues for showcasing the visual arts, presented live performances of drama, music, poetry, puppetry, and free form parades in the neighborhoods of Highland Park, Mt. Washington, Glassell Park, Eagle Rock, El Sereno and Cypress Park.